The active folding wheelchair is an active style wheelchair allowing either self or attendant propulsion. It has been designed to suit the terrain found in semi-urban areas of developing countries. It utilises two medium sized castor wheels at the front and two bicycle wheels at the rear to negotiate uneven ground, whilst providing good manoeuvrability in an urban environment. 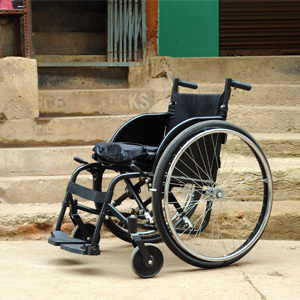 The chair has been designed so that parts are easy to replace or repair and uses common wheel and bearing sizes. The chairs are individually assembled and fitted to each user by trained assemblers & prescribers. The active folding wheelchair and its packaging are designed for easy disassembly for recycling or reuse. Every wheelchair is supplied with a contoured pressure relieving cushion. Each cushion has a cover. Source: Motivation. (2011). Product Summary.